As an HR director, you bear a trifecta of formidable challenges in risk management: creating the employee training curriculum, optimizing company resources to get the most value out of employee training, and tangibly limiting “people risk.” One of the biggest challenges that HR directors face is creating an environment that fosters intuitive employee risk management—where employees enact positive risk management techniques of their own accord even in the absence of aggressive compliance monitoring. To create a culture of positive risk management, HR directors must use an employee training solution that engages employees and inspires proactive risk avoidance. A limited onboarding and training curriculum may contribute to organization-wide people risk—an inaccurate or incomplete curriculum will perpetuate misunderstandings about critical workplace safety guidelines. HR directors face an enormous challenge in measuring knowledge retention after employee training. Unless learner assessment is ongoing, the first sign that an employee has failed to grasp fundamental risk management techniques may be an incident. Effectively limiting people risk requires you to have a comprehensive employee education program in place that can be easily be adapted to employee knowledge gaps revealed during performance or learning assessments. When employees may be faced with tasks of enhanced risk during specific projects, use scheduled “response-required” email reminders to keep risk management tips top-of-mind. If you are using a learning management system (LMS) for employee training, adding a short embedded video or a gif that is linked to a brief lesson on a relevant risk management topic can be a simple way to provide workers with the critical information that they need that day. It is easy to introduce game-inspired tools—such as a points system and leaderboards—into risk management awareness programming. Soliciting a weekly self-evaluation score from employees for compliance to a specific risk management guideline is a way to encourage accountability while helping workers remain mindful of the daily impact of their risk management behaviors. If you are using an LMS, then it is simple to create a library of interactive resources for employees to use when they have a question about a risk avoidance issue. Creating a daily pop quiz with a link to a resource answering a pertinent risk management question allows you remind employees of their self-help educational options while reinforcing key concepts. You need a simple way to launch, manage, and monitor employee compliance training programs—that’s certain. But you may also be facing roadblocks in creating and maintaining effective compliance training programming—diverse employee learning styles, time management limitations, and unreliable learner assessment methods. A simple way to leapfrog over the above roadblocks is to use a cloud-based LMS. 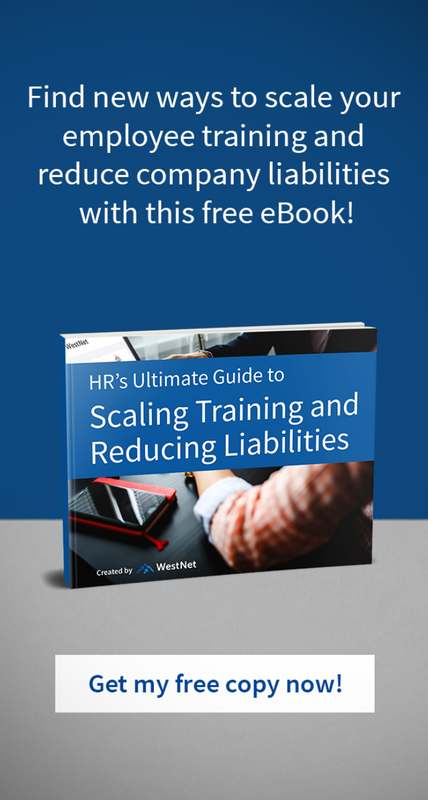 A full-featured LMS offers HR directors a way to track employee training results and connect employee performance with specific compliance knowledge gaps. You won’t have to start from scratch and build your own learning platform or spend months creating content modules for video, live streaming, or interactive assessments. Like everyone else, it’s likely that your employees are online most of the day, and a cloud-based LMS allows you to provide access to risk management training to your employees wherever they are—through an app, mobile, or the desktop. When you use global messaging and mobile-friendly training content from your LMS to conduct risk management training, your employees can stay up-to-date on alerts and learn at their own pace allowing them to maintain productivity at work while staying accessible. Encouraging the broader incorporation of risk management practices at your organization goes hand in hand with comprehensive employee risk avoidance training and performance analysis. Using an LMS means taking much of the burden of risk management competency monitoring away from the HR and shifting it to reliable technology that’s designed to help you focus on the essentials—keeping your workers safe and limiting your company’s exposure. Effective people risk management requires a system that gives HR directors the power to create and continuously reevaluate educational and performance benchmarks. If you would like to learn more about risk management, or how to implement specific techniques, schedule a 1-on-1 strategy session today.